Experiencing senility daily since... I forget. 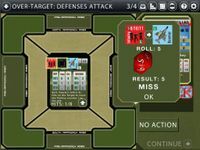 This is a review and session report of sorts for the IOS game Phantom Leader. I am a long time gamer who enjoys just about every type of game out there. Many of my favorites are war games. So know that I am not a war gaming newbie by any stretch of the word. 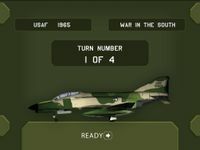 Having said that, I am finding Phantom Leader, a game about air combat during the Vietnam War centering around the Phantom, to be very frustrating. The amount of chance that is involved is overwhelming. After playing (and losing in embarrassing fashion) 5 short campaigns and 1 medium campaign, I am beginning to think that I am either a dolt (many would agree with this statement) or not using tactics or a game mechanic correctly. It often appears that there is little to no chance for some of these missions to succeed. Following is a crude step by step run through of the first day of the last short campaign I played. Interested potential players can get an idea of how the interface and game mechanics work. Follow along with the pictures taken from the app to see what the interface offers and also to see just how terrible a job I do. Hopefully someone who knows all the ins and outs of this game will tell me what the heck I am doing wrong with my tactics. Once past the start panel. You are presented with 3 game slots enabling players to have up to 3 in-progress games saved at one time. Once you have your game slot selected, the game plays in a very linear fashion. You begin by choosing which campaign you wish to play. There are three things you must decide. First, the time period for your campaign. This can be either 1965, 1967, or 1972. This determines the pilots, planes, and munitions that may be used. Second, you must choose to play as either the USAF, or the USN. Third, you select the length of the campaign, short, medium, or long. This determined the number of missions you will have for the selected campaign. When all the permutations are considered, this makes for quite a few options and a lot of re-playability. 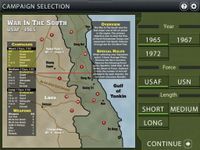 I chose 1965, the USAF, and a short campaign. The next step is to pick your squadron. Based on what you selected for the campaign, the pilots and planes will vary. Pilots can range from newbie to ace. 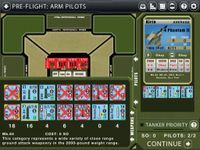 The left hand side shows the number of pilots and their classes that can be selected. 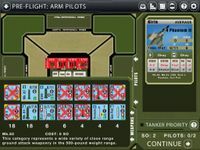 The right hand side is a scrolling panel that lets you choose the pilot and plane. For this campaign I can start with 1 newbie, 2 green, 1 average, and 1 skilled pilot. The plane cards show the important information about the pilot and plane. Once the squadron is selected, the game gives you an option of spending the 2 SO (special operations?) points you start the game with to promote a pilot to his next skill level. Not sure how the interface works here. There is some type of toggle that you can set to promote or demote. It's confusing. I only know that SO's are a commodity you never have enough of in this game. Next comes the Pre-Flight Target Selection. 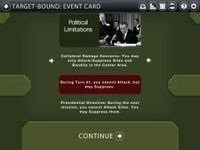 Based on your current political points, you are given a number of target cards to choose from. Usually it is 2. This information appears on the right of the screen and is scrollable left to right. You can only pick a target card that is less than or equal to the current political rating. 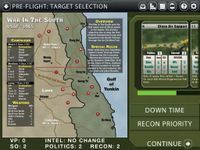 The target card gives you an idea of what to expect on the ground and in the air around a target based on the Sites and Bandits rows. It also tells you the maximum number of planes you can send. In this situation, I have a choice of either Close Air Support, or Ground Support. I will go with the Close Air Support Target. Next, the AI places the defensive sites in and around the target. Now it is time to select the 2 planes that will go on the mission and arm them. This is a key part of the game. If you choose the wrong type of weapons to take, you have lost before you leave the runway. Now let's get into the nitty-gritty a bit. If you look back at the target, you will see that it is a 'Soft' target that requires 8 hits. If you look at the plane, you will see the Phantom has a weight of 6 for this mission. This varies a bit based on where the target is. The further away, the lower the weight number because you need more fuel. When placing equipment on the plane, you cannot exceed the weight. The weight of the weapons is represented by the upper left number in the square of the weapons counter. The number of counters you have to use is shown at the bottom of each weapon column. If there is an 'X' over the counter, it cannot be used on this plane for this mission. I will equip both my phantoms with the same equipment. The three numbers at the top of each counter represent the 'to hit' number needed to score a hit. If roll equal to or higher than the first number, that's one hit, the second number, that's two hits, the third number, that's 3 hits. Some weapons only have 1 or 2 numbers. You will see that I picked BLU-1. It has 2 weight points. Score 1 hit on a roll of 3-6, 3 hits on a roll of 7-9, and 3 hits on a 10 plus. The 'S+2' gives me a +2 against 'Soft' targets. Essentially I will only miss on a 1 in most cases. Why didn't I just make each weapon one of these? Because of the SO points. The better weapons can only be bought with SO points. I had two. Both pi;ots will get 1 of these. I also picked up a MK-84. It has 2 weight points and hits on a 5/7/8. Both it and the BLU-1 have a range of 0 which means I can only attack targets in the same location as the Phantom. The last two weapons I loaded for each plane is rockets. They are +3 versus soft targets and can be fired from 1 area away from the target. I was not able to equip any air-to-air missiles. I could have equipped a gun mount, but elected not to. It's base hit number is 10. Because of this, my planes will not be able to attack any enemy planes I may encounter. Now it's time to take off and fly to the target. 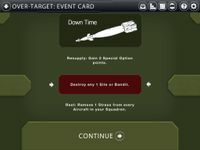 A Target-Bound Event Card is drawn. This is an example of one of the really bad events that can happen to you. I drew 'Collateral Damage Concerns' – I can only attack the enemy that is in the center target location. If I get there and find that there are enemy sites in the approach areas I'm screwed. The target card I picked indicated I would have only units in the center area so I may be safe this time. I have drawn this card before and had to run a barrage of attacks just to get to the center target. Things never went well for me in those instances. If I was role-playing, I would have aborted those missions, but this is a game and in order to win a short campaign, you really need those points. I elect to continue and not abort the mission. Next I place my planes. I will come in at high altitude (notice the 'H' in the corner of their counter). I will not face any enemy fire that way until I am ready to attack. Next comes the over the target event card. Wow. I lucked out. Something good for once. Notice there are three sections to each card. The top section is the event when you are on your way to a target. The center event is the event when you arrive at the target. The bottom event applies when you are returning to base. I guess this is the way the cards are in the board game version. One card, three purposes. For the IOS interface, why bother showing the two events that do not apply? Why not just show the one that does? I destroy their best unit, the ZU 23. I only have three things to worry about now. This is by far the easiset mission I have been on yet. We are now ready to play out 4 turns of combat which represent how much time I have to spend in the target area. I move in closer and descend to low altitude. I will try to take out enemy sites with missiles. Note I could elect to fire on the target instead – it needs 8 hits – but I am depending on my better weapons to take it out. Besides, if I can take out those 2 sites, I will only have to worry about 1 defensive attack. One of my pilots is rated as 'fast' so he will get to fire before the defensive sites. 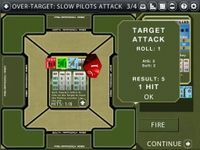 I target a site with a missile and roll. Because this is a soft target, I hit on a 4 or better. I roll an 8. Kablam! That's one down! Now it is the defensive fire phase, but the other defensive sites can only fire at me when I am in their area! And I'm not! So we proceed to my 'slow' pilots attack phase. I once again target a site with my missiles and fire. I rolled a 10! Kaboom! That just leaves one bee to worry about. Let's move ahead now to the next aircraft movement. My planes enter the target area. 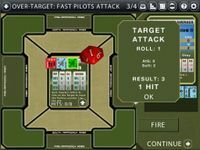 My fast pilot attacks. I ignore the defensive site that remains and drop the napalm on my mission target. I am + 2 to hit. I stand a decent chance of scoring more than 1 hit. I roll a 1. I score only 1 hit against the target. Now the defensive site attacks me. It hits on a 6/10/11. I can evade but doing so means I will not be able to attack, so I just sit and take it. The AI rolls a 5 and misses. Now my slow pilot drops his napalm on target. I roll a 1 again. That gets 1 hit. I have 2 of the 8 I need. I was counting on more from my two napalm attacks. This is suddenly not looking so good. Combat continues. To sum things up, I roll a 3 on my next fast attack which missed (I needed a 5/7/9). The defensive site likewise missed. My slow pilot rolled a 2, which missed (again I needed a 5/7/9 – which was really a 4/7/9 because my pilot was +1 skilled). So it is now time to head home. I get a rather meaningless home bound event card. I managed 2 hits against the target which leaves it quite operational. Trust me when I say, as bad as this was, it was one of my finer results. I did not lose any pilots this time. At the end of day 1 of the campaign, things do not look good. Pilots now receive an experience point if they went on the mission. Pilots that did not fly on the mission recover stress points. And it is time to do it all again. Day two and the final mission of the campaign. So what happened, you ask? Well, the targets I got were all difficult. I picked one. All of the good weapons were used in the first mission, and I had no SO's to purchase the best ones that were available. Still, I struggled onward. 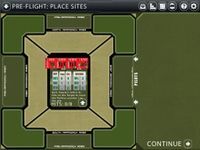 While flying to the site the random event card added 2 enemy sites to each approach area. When I got there the site was swarming with defense. There was no way I was going to survive this attack (I know, I have gone in before under similar circumstances) so I just aborted the mission. The result: a dismal rating. That is, by the way, the only rating I have ever gotten on any of the campaigns I have played. As to the missions, I have flown quite a few now. I was successful only ONCE. There is more to the game that I did not go into. Pilots shot down can be rescued sometimes and returned to the squadron with a lot of stress. 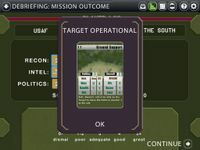 Successful missions move the counters on the campaign chart making more targets available to you and lessening the chances for enemy intelligence to know your planned attack. You can use electronic counter measures to avoid attacks (if you can equip them) and you can also drop one of your weapons to avoid some attacks. If you want to get into a dogfight with enemy planes, you can. You have the option of dropping some of your ordinance to increase your chance of scoring a hit in those cases, but if you do, there will be no way you will be able to destroy the mission target. I am finding this game very frustrating. Doing the math in my head when I count the number of hits required to complete the mission by destroying the target and comparing it to the number of planes and ordinance they can carry, there are some missions that are virtually impossible to win. I need to try the longer campaigns to see if they make a difference. I have not used the USN yet. I have almost exclusively used Phantom's. There -must- be something I am not seeing or doing that will make it easier for the player to do well. I sure have sucked at this so far. I cannot speak to the historical accuracy of the game, I do not know that much about the Vietnam War. It looks like everything is very accurate historically, but I leave that for others to decide. I have never played the boardgame this is based on, so I likewise cannot speak to any differences between the two. 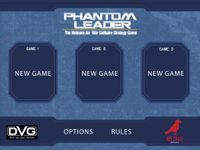 Concerning the Phantom Leader app, I found the interface a little quirky at first. I have gotten used to it. Like I said, the game seems very difficult to be successful at. It has a lot of points where hard decisions need to be made like the choice of weapons for your planes, which is good. But once the combat starts, I feel almost helpless. There seems to be obvious steps that need to be taken, but too often walking down that path gets your pilots killed. It only takes one bad die roll to be shot down. And it seems like sometimes you can lose a mission on just one bad die roll where you miss your target just once. It's not a lot of fun when you need to have almost a 100% accuracy on your attack runs and the damned die roll goes against you. Maybe I read too much Tom Clancy when I was younger, but I thought all this technology vastly improved our pilot's survivability and combat effectiveness. The limitation on what you can equip your plane with based on using the SO points is really annoying. Maybe it is historical. I do not know. But not being able to equip my pilots with what they really need to survive and have a chance to complete the mission really gets stale fast. Do I recommend this app? Mostly no. 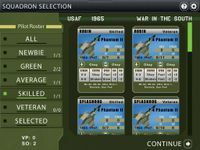 It is very much a niche app for wargamers interested in the air war over Vietnam. If that subject interests you, and you can put up with constant failure, I think you might like the app OK. And when I say constant failure, perhaps I am being too hard on it because of the failures I have experienced. Like I said at the outset, maybe I am just a dolt when it comes to air combat. This is the first game like this I have ever played. But in any event, if you are a casual wargamer, ot have no interest in the subject, I would stay well away from it. You hit the nail on the head when you said that SOs are something you never have enough of. One thing I figured out after a few plays is that the number of SOs you get vary on the type of aircraft you select. The F-105 isn't as capable as the F-4 but the additional SOs make up for it. I tried 1 or 2 F-4s, as many F-105s as were available and 1 F-100. Was finally able to win a couple campaigns but they are TOUGH! If this app is ever released for Android, I'll be first in line to hand them my money. Thanks for the in depth look at the app, and your thoughts on the game. Why attack the sites in the centre? Or indeed, why attack any sites at all? 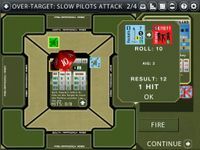 My standard approach is to shoot anything that is going to make three attacks at my planes, shoot anything that will attack twice if it's reasonably nasty, and deal with everything else with suppressing fire; rockets are really good for that. Then fly right up to the target and flatten it. There are other ways to mitigate the die-rolling elements - this is one of the most important aspects of the game - and you throw enough times during a campaign that things tend to even out. FWIW, I was finding it really tough going too, although my last two campaign results have been Good then Great. 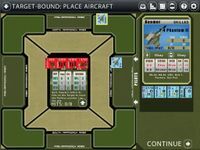 '65 means you have no bandits to deal with, but far fewer planes; I've had more success with '67 campaigns, when you also get a lot more of your own planes to fly. Some targets in 1965 can be very hard due to the fact that you get two less aircraft per mission. However a lot of the targets are very simple to destroy in 1965 if you pick the F-105 (or A-4 for Navy), preferably ones with +2 air to ground. This is because they can use the AGM-12 which means a number of missions can be won in turn 1 from high altitude, also the F-105 gives SO points and although the AGM-12 costs 0.5 SO points you should have enough if you save your points for these weapons. Also it is only worth attacking sites if they will get more than one attack against you during a mission, or they are the mission target, otherwise easier to just suppress with rockets. In later years the F-4 is more useful. Bill - Than kyou for a great in-depth AAR! You're right, the missions are tricky to suceed in. There can also come a point where a mission becomes pretty much unwinnable even though you still have weapons under the wings. My guess is, if you try a few more missions and change up your aircraft selection, things will go better. Thanks for the report on the game. I'm working to streamline some of the UI elements for everyone. As for the gameplay itself, try and focus more on the goals of the mission rather than on destroying every site. The longer campaigns can also be a bit easier because they allow you to take more pilots on each mission. Yes there are tweaks in could do with and...Well I haven't won yet, came damn close once in 3 games...but I have to say, as expected the game IMHO is bloody, edgy, great FUN! It's always interesting to see how other people approach things. 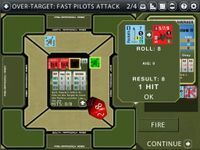 My basic strategy in the Leader series is to carefully choose my approach and altitude to avoid any combat on the way in if possible, and to neutralize any defensive threats using fast pilots or standoff weapons, thus denying the enemy any shots at my planes. Only when the defense is neutralized do I go after the mission target. Don't forget, if you are carrying AtG munitions you can drop your entire load on the mission target in one attack phase. Unless you are planning on keeping some munitions as insurance against a bad homebound event, there is no reason not to salvo your entire loadout. 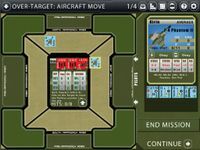 This also supports the zoom and boom tactic some previous posters suggested; use suppression fire to keep the defense from firing so one or two planes can take out the mission target. With a little more experience, I suspect you'll reach a point where the individual missions aren't quite so challenging. For me, the real meat of the game is managing the stress levels of all my pilots once you're several days into the campaign. The long campaigns are the best as far as I'm concerned. The app game is impossible to play. It is frustrating as opposed to fun. It seems to me to pro defense with no opportunity for scaling. I cannot believe it was play tested very long or at all before release. This is a game which really rewards, practically requires, close reading of the rules and cards and understanding of the game mechanics. I say this because you made several important errors in your description. One big thing is that the rockets do NOT get a +3 against soft targets. They, instead, get a +3 on Suppression rolls. Rockets are really not very good at destroying ground targets; you got a couple lucky rolls when you were striking sites. Their primary purpose is to suppress enemy attacks; a successful suppression roll negates the attack. On a related note, it's not true the selecting Evade means that you cannot attack. Rather, it gives the pilot 2 Stress points (which could lead the pilot to be Unfit and therefore not be able to attack, but that's rare). Deciding when to suppress, when to Evade, and when to simply take the risk of a straight attack is a critical tactical consideration. More and more, I'm finding Evasion to often not be worth the effort. You mention concern about not being able to deal with enemy airplanes. However, in the 1965 campaign there are no enemy planes (Bandits) to deal with. As Marstov said, remember that you can drop all your air-to-ground munitions at once. This is something I didn't understand at first, and discovered it by accident. Similarly, if you are attacking an enemy plan, you can fire several missles at once. It is important, though, that you cannot then decide to cancel such an attack; if you fire 3 missles, and the first one kills the enemy, the other two are wasted. This is not a simple game, nor an easy game. I'm still learning so I tend to think of it as being a roguelike; I go in knowing I'll die horribly and try not to make the same mistake again. Even if you plan perfectly, a few bad rolls can totally wreck your chances. The nice thing is that playing on the app means that a mission is quick; no cards and counters to keep track of. You can play through a campaign in a half hour or so (well, maybe not a Long campaign), take note of what worked and what didn't, and then replay history. For me, the real meat of the game is managing the stress levels of all my pilots once you're several days into the campaign. The long campaigns are the best as far as I'm concerned. Yes, definitely, and I'm slowly learning how to handle this. I'm leaning toward using more of my SO's for things like R&R and getting by with more basic weapons. It's tough when a fat, juicy target appears (like the Steel Works), only to realize that I don't have 7 pilots who aren't curled up in a fetal position. And THEN you've got Politics to deal with. I've been looking for this, but could not find it anywhere. 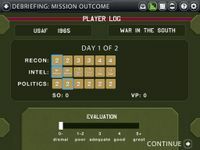 Is it possible that when playing the Long (12day) variant with USN, you cannot win with a "great" result (36+ points) due to politics? I tried to do the math, but even assuming free access to the target cards (or spending SO to draw what you need) I can't even find a theoretical way to score 36 pts. You start with 10 politics points on the track, recover 1 per day and have to score 3 points on average per day to make 36 after the 12 campaign days. Sure, there are missions that give you politics if you overkill (total of +8 politcs) but these typically score low VP. Anybody worked out a combo to score 36 pts? I asked the same, still never found the tutorial. Just muddled through, great game. Don't forget, if you are carrying AtG munitions you can drop your entire load on the mission target in one attack phase. Holy crap, I didn't know you could do this. Thanks for suddenly making the game a lot less brutal for me! Yeah, the app is quite obtuse. Definitely suggest people read the manual and the little text blurbs before each step to help them grok this game. I say this because you made several important errors in your description. One big thing is that the rockets do NOT get a +3 against soft targets. They, instead, get a +3 on Suppression rolls. Doesn't the app take care of rules adherence issues like these?